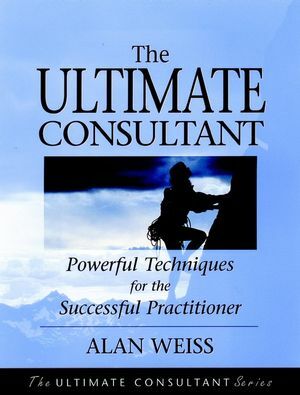 The Ultimate Consultant--the first book in a series written for experienced practitioners--is filled with helpful interviews and vignettes from an array of successful consultants from around the world, and offers the templates, examples, information, and tools you need to transform your business. With this indispensable resource as your guide you can learn how to become an ultimate consultant and take your business to new heights! 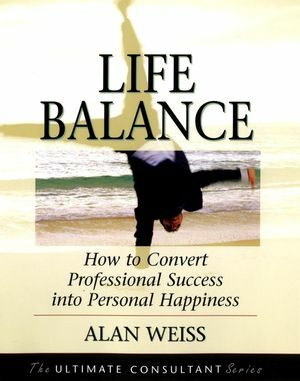 ALAN WEISS consultant, speaker, and author-is the founder and CEO of Summit Consulting Group, Inc. His clients have included Merck, Hewlett-Packard, State Street Corp., Fleet Bank, Coldwell Banker, and Merrill Lynch. He is adjunct professor in the Graduate School of Business at the University of Rhode Island where he teaches a course on advanced consulting skills. Chapter 1. Acquiring Fortune 1000 Clients: Why Size Doesn't Matter. Establishing Relationships with Major Buyers: Rainmaking. Ten Techniques to Build High-Level Buyer Relationships: Making Rain. Using the Springboard to Other Potential Clients. Ten Techniques for Springboard Marketing. Chapter 2. Value-Based Fees: If You're Charging by the Hour or Day, You're an Amateur. The Concept of Value-Based Fees. The Key to High Fees Is Not to Mention Fees. Thirty-Eight Ways to Increase Your Fees, Beginning Tomorrow. Chapter 3. Marketing and Publicity: Creating Gravitational Pull. Creating a Strong Gravitational Field. Word of Mouth, Referrals, and Third-Party Endorsements. Chapter 4. Branding and Celebrity: A Brand in the Hand Beats Feet on the Street. The Fine Art of Contrarianism. Testing and Protecting Your Brand. Ten Ways to Promote Celebrity. Chapter 5. Passive Income: Making Money While You Sleep. Chapter 6. Joint Ventures: When 1 + 1 = 64. Forming Alliances with Larger Entities. Chapter 7. International Business: The Peripatetic Consultant. Ten Reasons Why You Should Get Out of Town. Approaching and Exploiting U.S. Multi-Nationals. Ten Ways to Establish an International Presence. Protecting Yourself as an Internationalist. Chapter 8 Managing Time: Or How to Be at the Pool by Two in the Afternoon. Ten Techniques to Always Squeeze in More Business. The Simplest, Most Effective Time Management Tool Ever Created. Tips for the Truly Time-Challenged. Chapter 9. Working with Family-Owned and Smaller Businesses: What to Do When You're Competing with the Mortgage Payments. The Large and the Small of the Small Business Market. Competing with the Rent Money. Managing the Owner's Emotions and Expectations. Special Section: Accepting Equity for Your Services. Ten Ways to Avoid the Perils of Consulting with Smaller Businesses. Chapter 10. Avoiding the Success Traps: Creating New Approaches and Taking Prudent Risks. Signs of the Success Trap. Creating Proprietary Models and Techniques. Chapter 11. Life Balance: The Ultimate Outlook. Working Less and Living More. Appendix A: Questions to Ask for Objectives, Measures, and Value. Appendix B: Components of a Sample Book Treatment. Appendix C: Sources for Media and Advertising "Experts".